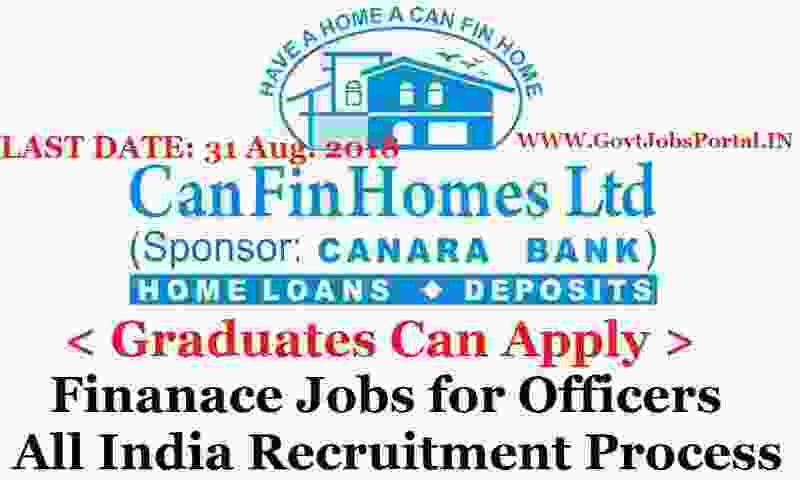 Those who want their careers in Finance company as an officers after competing their Graduation from a well-known university of India can apply for these Finance jobs for Manager and Probationary Officers. Can Fin Homes Limited is one of the leading Housing Finance Company in India. This Finance company have 186 branches/AHLC/ Satellite Offices spread across all over India. This organization is inviting On-line applications for filling up the various vacant positions through this recruitment process. candidates have to apply online for these Government jobs in India 2018. Various Finance jobs which are going to filling up through this recruitment process are for the posts of Assistant General Manager –Finance & Accounts, Senior Manager Legal and Probationary Officers. 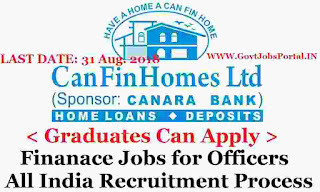 Those who are wanting to make a careers in Finance company can apply for these Government jobs through the official Company’s website www.canfinhomes.com and submit the application online by clicking on the link http://www.canfinhomes.com/job. Please read the advertisement carefully and ensure your eligibility before submitting the online application. We share the advertisement link under IMPORTANT LINK section at the last of this article. More information related to these Finance jobs in India is given below in this post. So read it till the end before applying online. Pay Band: Rs.17,850 – 34,850+ Other Benefits. Age Bond: Must have age in between 21 years to 30 years for applying these Finance jobs in India. Age Bond: Those candidates can apply whose age lies in between 21 years to 35 years for applying these Finance jobs in India. Age Bond: Should have minimum age of 28 years and maximum age of 40 years for applying these Finance jobs in India. What is the Educational Criteria for applying these Finance jobs in India? Should have minimum 60% marks in the Graduation for applying these Finance jobs in India. Candidates who have 5 year LLB degree or 3 year LLB degree can apply for these Government Jobs. Payment Method: Candidates can pay through any of the Commercial Bank to the credit of “CAN FIN HOMES LTD –OD No. 2636261000147, Canara Bank, Prime Corporate Branch, Bangalore (IFSC Code No. CNRB0002636) through NEFT/Internet banking and mention the details of UTR No under Transaction ID in online application in the specified column. · All candidates should have a valid mobile number / personal mail ID for login. · Candidates should register their mobile number/ e-mail id through the link which we shared under IMPORTANT LINK section at the last. · Applicants are mandatory to upload their photograph and signature. · Those who are filling up the application form online, should wisely fill in all the particulars carefully at the appropriate places in the online form and click on the “SUBMIT” button at the last. · Once you Submit the application form on-line, you have to take the print out of the system generated On-line Application. After that you have to take out that application form with you during the interview time along with other documents / certificates, if shortlisted. 31ST Aug. 2018 is the Last Date to accept application. Disclaimer: We took this information from the following website: “http://canfinhomes.com/”. So all rights related to this Article goes to this website only.